OctoPre MkII offers eight channels of pre-amplification. PRESS RELEASE: Focusrite are pleased to announce the imminent arrival of their latest eight channel pre-amp. OctoPre MkII features eight channels of Focusrite pre-amplification and a built-in 24-bit/96kHz ADAT output, providing an affordable input upgrade for your Pro Tools system, or any digital audio workstation. Combining award-winning Saffire PRO pre-amps with high quality digital conversion and JetPLL™ jitter elimination technology, OctoPre MkII is the best sounding multi-channel mic-pre in its class. 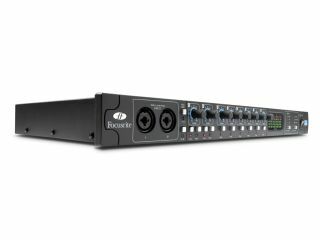 The digital output allows users to make the most of often-neglected ADAT inputs; ideal for expanding the number of mic-pres for interfaces such as the Saffire PRO 24. Connect OctoPre MkII to your audio interface's ADAT input to create a high quality, multi-channel studio recording solution. OctoPre MkII is equally suited to the live environment as a quality mic-pre expansion for any analogue or digital console or hard disk recorder. With line outputs on every channel, each mic-pre can be routed to a separate channel on an analogue mixer with the ADAT output left free to send a copy to a digital recorder. OctoPre MkII has been optimised for drum recording. Designed not to clip, 10dB pads are provided across each channel, while the gain range of the pre-amps has been tailored to handle extreme levels from sound sources like the kick drum. Equally, Focusrite pre-amps are renowned for the way they handle the dynamic range of vocalists, and these pre- amps are no exception. Finally, OctoPre MkII's first two channels also feature DI's, so it can also turn its hand to recording Guitar and Bass. OctoPre MkII features everything else you'd expect from a multi- channel mic-pre solution; 5-LED input metering on every channel, switchable phantom power and a variety of internal and external clocking solutions.